Curious to know how your content has improved? At a glance, you can see the average Acrolinx Score, that is the Score of the current state of your documents, by the last check. 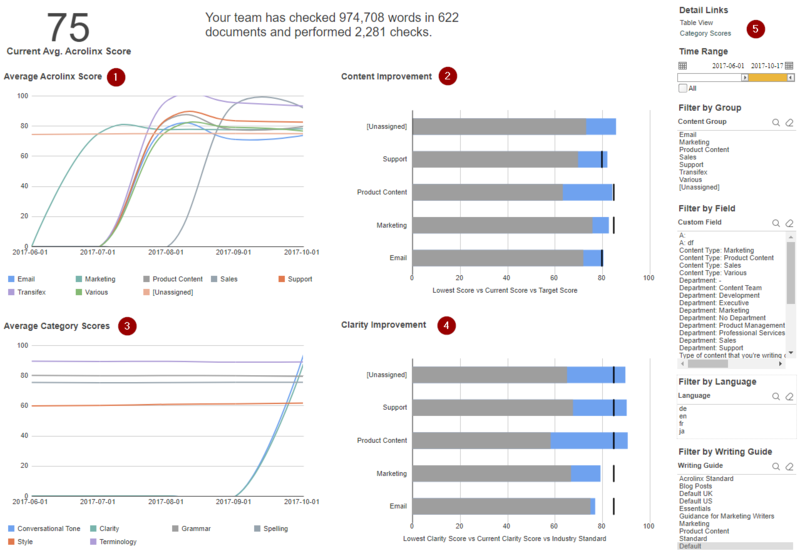 You can also see how many checks your team has performed and how many words and documents were checked. Let's take a look at the different charts to get further insights on how Acrolinx has helped you to improve your content. Average Acrolinx Score View how the average Acrolinx Score of your Content Groups develops over time. Average Category Scores This shows you the Acrolinx Score for the different categories. You can keep tabs on how the categories develop over time. Content Improvement Keep track of how your content improves over time. For each Content Group, you can see how the lowest Acrolinx Score compares to the latest Acrolinx Score. The black or green vertical bar shows the target score for each Content Group. Clarity Improvement Keep track of how your Clarity improves over time. For each Content Group, you can see how the lowest Acrolinx Score compares to the latest Acrolinx Score. The black or green vertical bar indicates the industry standard. Category Scores See all category scores by time period and watch the development over time. For example, you can see how the score for spelling develops over time, by adding a category filter and filter for Spelling .